The Pirates announced that they have signed free agent reliever Jason Grilli to a two-year deal. The sides agreed to a two-year, $6.75MM contract, Scott Miller and Jon Heyman of CBSSports.com reported (on Twitter links). Former MLB player Gary Sheffield represents the 36-year-old right-hander. Grilli enjoyed tremendous success in the Pirates' bullpen from 2011-12. He posted a 2.91 ERA with 13.8 K/9, 3.4 BB.9 and a 30.7% ground ball rate in 58 2/3 innings for Pittsburgh this past season and earned $1.1MM. Grilli ranked 33rd on MLBTR's list of top 50 free agents. Grilli's fastball averaged 93.6 mph this past season, his top velocity since 2007. He generated swinging strikes 14.4% of the time, a career high. 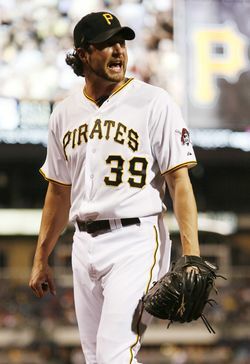 Not surprisingly, Grilli's strikeout rate increased yet again in 2012, when he struck out 90 of the 244 batters he faced. The Cubs, Blue Jays and Giants were among the finalists for Grilli, Peter Gammons of MLB Network reported last week. The ten-year veteran turned down slightly bigger offers elsewhere to stay in Pittsburgh, Danny Knobler of CBSSports.com reports (on Twitter). Grilli turned down a more lucrative deal from the Blue Jays, Bob Nightengale of USA Today reports (Twitter link). Photo courtesy of US Presswire. Ken Rosenthal of FOX Sports first reported the agreement (on Twitter).